On July 18th, Rigid Bits invites agencies that sell Life and Health to join us in an overview of HIPAA and services that can simplify your compliance efforts! This July 18th, we’ll be hosting the webinar discussed below to take a closer look at HIPAA compliance requirements. Learn how to determine if HIPAA regulations apply to your business and educate your company on ways to avoid HHS fines for HIPAA violations. Over the last couple years, we’ve been seeing an increase in the number of breaches related to misconfigured systems, exposed RDP servers, and ransomware attacks. These can all lead to instances that require deeper investigation to determine if Protected Health Information (PHI) was exposed and possible audits from the Department of Health & Human Services (HHS). With all of the new data security legislation and HHS starting to crack down on non-compliance, it’s important to take a closer look at your current information security program and HIPAA compliance. Breaches are costly enough as it is, being fined for not meeting minimum requirements like documenting your efforts, training, or testing your systems just adds insult to injury and can be avoided. Roughly 80% of businesses that believe they are compliant would still fail an audit. In this 30-minute presentation, you’ll learn more about who is required to be compliant, common pitfalls in the process, and affordable options that make HIPAA compliance easier than ever. This is the same service we use for our own HIPAA compliance and we are happy to promote awareness of this great tool from our friends at Compliancy Group! 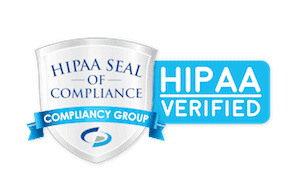 We invite you to learn more about HIPAA and how Compliancy Group uses a team of former HIPAA Auditors to support you through the process of achieving, illustrating, and maintaining HIPAA compliance. Across thousands of customers, this service boasts a 100% audit success rate.